Concerns about toxic stress, deep childhood/youth anxiety and trauma are in the spotlight in schools and communities, not because they are new issues but because we are beginning to come to grips with the impacts and outcomes for so many kids. There was a time when social-emotional and mental health issues were directed to counselors or district staff for attention from those highly trained specialists if such resources were even there. In other venues, an old belief system was still operating, one that revolved wholly around expectations of self-control and willpower – a flawed and inappropriate way to address dysregulated behaviours and overwhelmed children. For still others, the whole topic was pushed outside the frame of a school’s focus because those things should be dealt with at home. In light of what we know today about how our minds function and in keeping with our commitment to every child, every chance, every day, it is no longer responsible to rely solely on specialists or on believing that “just get over it” is a remedy. Nor can we count on the home or external agencies to “deal with” the impact of social-emotional stressors on the children we teach. It’s true that the number of organizations focusing on mental health is growing rapidly. It is essential that in concert with such work, we are full participants (and leaders) in a universal call to action. Everyone working in the schoolhouse should be aware of and in tune with their unique role in impacting the trajectory of kids’ mental health, safety and long-term success. Children at the center of such a commitment should see evidence of coordinated support surrounding them. Because we know that kids who are overwhelmed can’t learn, more and more schools are creating safe and reassuring environments where those children can begin to experience what it’s like to let down their guards and participate in the learning journeys we have designed for them. Sanctions and negative consequences don’t create that possibility. The bus driver, playground supervisor, classroom teacher, education assistant and everyone else who interacts with kids during throughout the school day understands the profound influence they can have: deliberate or unconscious; positive or negative. Take a moment to watch this brief video from the Atlanta Speech School. It illustrates exactly what this looks like. https://www.youtube.com/watch?v=VxyxywShewI The video is under 4 minutes long – a tiny (and powerful) investment of time to remind us of what school can look like through the eyes of the learner. Where’s your school in this journey? Take a look at the three generalized types described below to consider whether school mental health is out of the closet and has become central to your professional mission and journey. Given what we know about learning, the learner and our roles in providing safe, healthy and nurturing environments, the path forward should be evident. Prioritizing social-emotional health and safety as foundations of our learning environments may cause some to say “Where will we find the time?...I’m already trying to jam too much instruction into an already crowded day…” To those objections we say that when one in five kids is overwhelmed and unable to learn and reach her potential, we have to make changes. We ask ourselves, “Without learning, has teaching occurred?” Let every school work to become a place that fits the kids rather than one that expects the kids to fit the school. With a tip of the cap to Dr. Stuart Shanker, Canada’s renowned self-regulation author, speaker, clinician and researcher, I have been thinking about how the chicken and egg riddle fits with schoolhouse norms. Stuart raises heritage chickens at his home in the country. They are beautiful birds, wonderfully self and co-regulating, laying rich, organic eggs…and tasting really good as a main course. They also remind us of the age-old debate about the chicken or the egg? from curriculum design to classroom layout to school schedules, we have begun to remedy old school rigidity and its inadequate approach to supporting learners. Today, we focus on building capacities and creating situations where every learner can experience success. Problem behaviours cause us to ask Why rather than to simply initiate sanctions. Students with challenges are invited to work in partnership with their teacher as detectives, exploring what led up to an incident and figuring out how some of those conditions could be mitigated. Co-regulation leading to self-regulation is part of the learning design as is increased choice and variety. In short, we have moved from requiring the student to fit the school to having the school – and all of its components – fit the student. We get it right when every learner’s journey is individually scaffolded with supports, some obvious and other subtle; some basic and others intricate and complex. Back to the riddle: chicken or egg? ; behavior or environment? By encouraging more curiosity and less old school certainty, our kids are supported to explore their assets and we get closer to fulfilling our mandate in education: We Build Human Capacity. This is our new year celebration: a change of season, the end of the summer holidays and time for the school year to start – sparkling classrooms, welcoming displays, class lists, new friendships… and boundless hope that this year will be a positive learning journey. For many kids, that means going from good to great achievement; for others can be a significant breakthrough with stronger foundations being formed so that learning starts to take hold. For another group, it is an ongoing search for the rhythm that will connect them to our learning places and us to them. It’s exciting and daunting all at once to open the doors in September for one of the most important rituals and asset building commitments any society can make. It’s “back to school” season in the malls, but it’s forward to learning for our hopes and dreams. With all of that hope, we need to consider how we have shaped the learning experience to help those dreams come true. I recently presented at a session where I asked the participants to consider which of the following thinkers from the past continues to have the most profound influence on today’s schools. 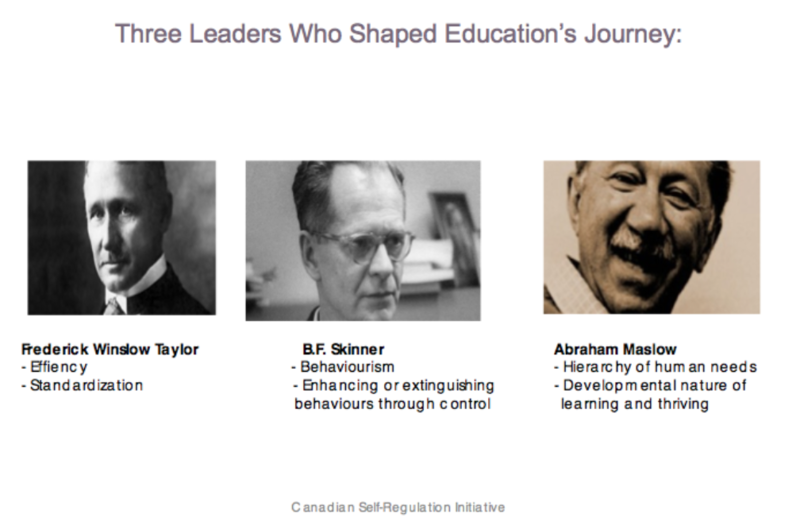 The three choices I provided were Frederick Winslow Taylor, B.F. Skinner and Abraham Maslow. The simple question was whose DNA is most evident in the structure, culture and operating norms of schools today? Is it Frederick Winslow Taylor, who deserves some consideration, given that we have put so much effort into achieving efficiencies and into standardization/quality control? Everything from school timetables, to curriculum & assessment, to the ringing bell summoning students and teachers to their work stations is testament to our efficiency drive. We have done a remarkable job of fine-tuning the school system to maximize standardization, to set parameters based on hours and minutes, days of instruction and bookends for learning. While there are some benefits, there are substantial problems with all of that. B.F. Skinner has also had a profound impact on schools, families, our justice system and all facets of society. Our memory of schooling and its history over 150 years is replete with hierarchical relationships based on compliance and control/reward and punishment. It was what we knew/It was what we did. A behaviourist approach – underpinned by unquestioned authority/obedience has been around for a long time, including but not limited to the schoolhouse. It has its limitations. A foundation built on exerting external controls doesn’t create the kind of environment where kids learn to thrive. 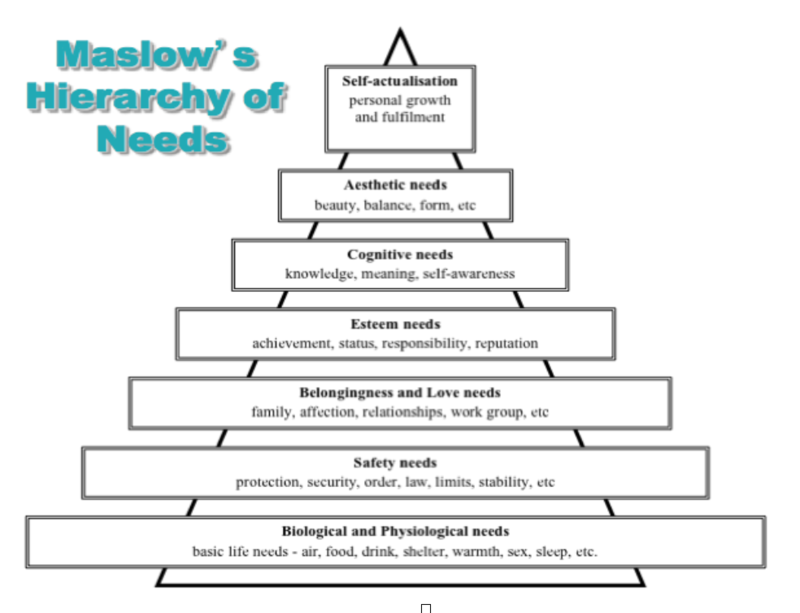 But what of Maslow and his pyramid shown here, starting with a foundation of basic life needs and building from there? We can also reference and borrow from the Olympic Games motto of Faster, Higher, Stronger. It isn’t a directive or a command, but a shared aspiration – a beacon to guide our path, a challenge to which we can aspire. What’s our schoolhouse version of Faster, Higher, Stronger and how do we help every learner achieve that? We might consider Maslow’s Hierarchy and particularly the high bar of self-actualization (personal growth and fulfillment) as our own version of Faster, Higher Stronger. It might be stated in a commitment like Every Child, Every Chance, Every Day, and we now have a much clearer understanding of what it takes to get there. As the opening bell rings, let’s take a look at how our schoolhouse shapes its structures, cultures and norms to meet that test. As with all important questions in education, it isn’t simple or easy – just essential. Could Captain Kirk Have Had It Wrong? But what if he was wrong? Now, more than ever, we are fascinated by another frontier – the human mind and all of its elements. Over the past decade or so, we have benefited from a golden age of neuroscience, one that provides unparalleled opportunities for educators to gain a deeper understanding of how the brain learns and how the mind works through a dynamic integration of mind, brain and relationship, combining to create physical experience, cognitive experience, emotional experience, relational experience. This emerging nexus between neuroscience and education is fertile ground for huge growth in interest in self-regulation and an uptake in schools and districts across Canada and beyond. At the Canadian Self-Regulation Initiative we support schools and systems in looking with fresh eyes on 150+ years of schoolhouse habits and rituals, many of which were based on old and insufficient understandings of how the mind and the brain function and how learning occurs. order is maintained thanks to behavior modification as reward & punishment rule the day. All of those old certainties (and many more) from bygone eras formed pillars of educational practice that are being replaced, not just repainted. This change isn’t about blame or shame, but it is a commitment that ensures what we know impacts what we do. Carol Dweck’s work on growth mindset is affirming and is helping to change the learning relationship for many kids and, in doing so, their life trajectory. If you haven’t seen her TedTalk, invest the time. It is a great resource. At CSRI, we share a belief about the potential of Every Child, Every Chance, Every Day. For that commitment to be realized, we are exploring and amplifying the nexus between neuroscience and education…and we believe that Captain Kirk might not have had it exactly right. This new frontier is even more complex and more important than the previous “final” one. When our ancestors believed the world was flat, their reference points and expectations were based on a flat earth reality. They could rationalize whatever they saw on the horizon or in the heavens in relation to their flat earth. It all made sense given the certainties of the era. One indisputable fact led to another and reality was established. At some point, a few brave souls began to consider and speak of different possibilities, ones that caused them some trouble as they challenged the infallibility of the flat earth truth. And when their wondering took flight and their voices gained confidence, evidence became more visible and new realities emerged. Goodbye old certainties as everything changed – and no one fell off the edge. When the 4 minute mile and the 10 second 100 yard sprint were unconquerable feats, great athletes simply couldn’t break through those standards. It wasn’t possible and many world-class runners tried and failed. The certainty that it couldn’t be done, that it was beyond human capacity, defined reality…until someone believed differently, someone ran faster and then it was done. Once the records were broken, the “impossible” barriers were conquered over and over again. Now there are high school runners achieving those standards. If a physicist from a millennium ago were asked about the possibility of traveling to the moon, the answer would have been that it couldn’t be done, never would be and such foolishness shouldn’t be spoken of again. That was absolute, based on all the available science. Eventually, new curiosities led to new theories that infiltrated old certainties and different realities began to emerge, born of a wonderful combination of curiosity and perseverance. How does any of this resonate in our educational galaxy? How many “old knowns” continue to rattle around our corridors and how many have we finally stopped believing and relegated to the archives, just like a flat earth and the unbreakable 4 minute mile? Another discussion piece presenting a very different look at system norms is Andreas Schleicher’s Five Things I’ve Learned http://bit.ly/1FaG01a. It honours the spirit of curiosity and the potential of new understandings to shift old myths to the past tense. Schleicher challenges assumptions that remain as building blocks of our education system even when flaws in their structural integrity have been exposed. In educational renewal work, we are finding ways to nurture new curiosities and bid adieu to those old certainties beyond their expiry date. Let’s continue to apply that when we engage in curriculum and overall system redesign; learner-focused assessment processes; multiple ways to engage kids’ interests and talents; relentless efforts to support our most vulnerable students; and, activating & applying emerging knowledge about neuroscience. It’s a long journey, but we won’t fall over the edge. From Factory Schools to Pogo Sticks: What Would Frederick Think? ​Frederick Winslow Taylor, a standardization and efficiency guru, was a profound influence on industrial-age best practices in the late 19th and early 20th centuries. The stuff of legend, he championed the effectiveness of uniform work stations, factory whistles to regulate employee movement, and specialized/rote tasks. He deeply understood that by replicating processes in tightly controlled environments he could maximize business output/cost per unit and ensure product consistency. These were laudable goals for making tractors a hundred years ago, but not so great for school system design. But the ghost of Taylor did cross the schoolhouse door, as was evident in countless versions of “factory model” high schools operating over the past century. Efficiency ruled, meaning that students had to fit into the pre-cast mould called schooling rather than having education wrap around the student. The 5 X 8 timetable was king and kids were (and still are to a large extent) batched by birthdate, deemed ready to start at the same moment and required to finish at the final June bell, not earlier or later. The appetite for standardization and efficiency also showed up in other ways: desk sizes in classrooms based on grade designation rather than student comfort (I remember those days), and text book titles ordered in bulk because one prescribed resource was deemed sufficient (and efficient) to meet a group’s instructional needs. There was also the matter of how the education rule book was written (contract language, board and government policy) as if there were uniformity across the system. Essentially, schools were configured, operated and furnished with the expectation that they would contain 30 similar-sized and similar-aged students all facing forward ready to “receive instruction.” With the gift of hindsight, it was an effort to impose a two-dimensional framework on a three dimensional world. Taylor would be shocked to see how far we have wandered from the mantra of uniformity, conformity and rules (see West Vancouver principal blog post link below). We aren’t all the way there yet, but many of today’s education spaces and learning/teaching rhythms are developed with a much richer understanding of the learner, her brain and the need for active engagement and individual challenge. Facing sideways or even backwards is allowed now that an appreciation of self-regulation has replaced top-down compliance and demands for self control. Open the classroom door and you will see micro-environments designed to meet students’ needs and learning preferences. Furnishings might include beanbag chairs, SWISS balls, wobble cushions and standing desks. Is that a spin bike at the back of the room? Those choices may drive the school district’s Purchasing Dept. to despair, but they are becoming part of a new normal. Take a walk down the hall to the Learning Commons, a far cry from the library stacks standing sentry to silence and isolation. See what creative teachers are doing to dissolve subject-specific silos to develop real-world interdisciplinary challenges for kids working individually and as members of teams. Check out the integration of nature into the classroom and the classroom into nature. It is all part of an inspiring and transformational journey. Unlike Taylor’s factory standardization, we understand that in our work, one size doesn’t fit all. Read Principal Judy Duncan’s post here: http://bit.ly/1lhG36Q as she reflects on some of her own “then and now.” Her school is orders of magnitude beyond a Taylor-designed factory or even its own realities of 5 or 10 years ago. Fewer rules, more guidelines; less “No” and more “Let’s see how that might work.” Pogo sticks in the playground? Probably even different sized ones. Why not. What would Taylor think? 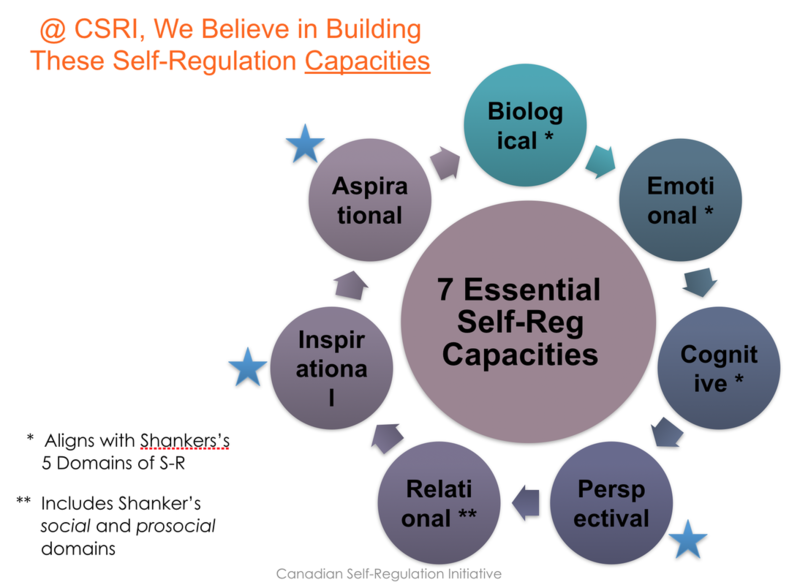 Our recent CSRI (Canadian Self-Regulation Initiative) Round Table in Vancouver connected educators and other youth service partners committed to learning more together about various approaches to self-regulation and what it takes for neuroscience to influence our system norms. Very quickly, the session went beyond the specifics of self-reg to the fundamentals needed to adopt any significant change effort. As the Transformation Agenda overtakes the status quo, we better understand what’s needed to supplant long-held beliefs about how learning takes hold. It’s a “big tent” conversation and an essential one. Introducing good ideas without a diffusion strategy feels like a candle in the wind. We know how often those efforts have bloomed and withered and how difficult it can be to activate the next one. David Albury from the Innovation Unit in London innovationunit.org says it well. He has studied and written/spoken about what it takes for innovation to go deep and what it looks like when it flounders. It isn’t a matter of hierarchical endorsement or the amount of money committed or a number of well-worn but flawed approaches to initiating change. Take a look at the Innovation Unit website for enlightened commentary on how implementation thrives. David’s experience across education, government and industry shines a light on how to move beyond exciting “pilot” projects into the So What/Now What? focus required to go deeper and broader to sustain momentum. System transformation can’t happen without that. It’s time to end the “silo” metaphor in our work with kids. Silos are great for keeping the grain dry and the rats out. Apparently, they are also essential in long-range missile operations. But in our work, they just don’t fit. The Round Table included professionals from outside the school system whose work is focused directly on dysregulated/resource-poor children and their families. These colleagues operate in government and non-government agencies with a mandate to change the life trajectory of our most vulnerable young people – the very kids who need a coordinated systems response that is thoughtful, research-based, strategic and aligned. Their work is our work but there is a palpable frustration that we haven’t yet figured out how to share and initiate joint work plans, specific strategies, access to resources and communications protocols. Statements of good will aren’t enough. It is time to take a single table approach to human capacity development. In doing so, we are far more likely to create the aligned and sustainable impacts our vulnerable populations need. No more silos. It’s time for deep operational linkages and commitment to a common focus. Before September school bells rang, many educators were engaged in a complex and productive dialogue about THE WHAT/THE PURPOSE of public education. That narrative continues; it revolves around curriculum revisions that go far beyond updating learning outcomes and changing resource materials. It is about the commitment to deep transformational learning rather than tired efforts to sustain the status quo by cycling through minor tweaks and calling them significant/game changers. Why is this so crucial? There is a “real-time” global context in today’s classrooms, courtesy of social media, 24/7 news cycles, increased social conscience, and competing pressures and priorities. That should compel us to design learning pathways that maximize engagement by addressing those complexities. We live in an “Ethical Dilemmas Are Us” society, so currency and relevance are essential. Simply put, it’s not a black and white world, so we can’t have a black and white curriculum with the answer key at the end of the chapter. A key condition for transformation to take hold is our acceptance that we (the system) can no longer “sanitize” the school experience to keep John and Jane insulated from controversial, values-laden, politically or culturally sensitive issues. If they don’t grapple with those matters at school, in a scaffolded, skillfully supported environment, where and when will they confront what really matters. A train traveling on the track from Toronto to Vancouver departs at the same time as a train heading from Vancouver to Toronto. At what point will the trains pass each other, moving at an average speed of 95 km/hr? Challenging problem? Maybe. Interesting/engaging? Not so much. There better more relevant and topical ways to demonstrate core skills. You can see numeracy and literacy, science and social studies, the Arts, economics, social justice and more in those few examples. “You treat education like a TV dinner. You tell us to go to the freezer, pull out a box, read the instructions carefully, take off the wrapping, puncture the cellophane, then set the microwave for the right time. If we’ve followed the instructions carefully, we’ll get full marks.” Full marks for honest perspective, anyway! We know better. We have to do better. That’s at the core of transformation. Quite a journey. …but it never did make the grade as a call to action for an education system needing something more authentic, substantial and current. It contaminated a progressive concept of accountability, one that we are still refining to support real progress. First, let’s acknowledge that no caring/compassionate society would tolerate the notion of throw away kidsor abandoned cohort groups. Communities of integrity don’t ignore, punish or marginalize struggling populations under the flawed assumption that “motivators” like sanctions and scarcity will promote redoubled effort and a greater likelihood of success. It just doesn’t work. Never did. We should also recognize that educators today more fully understand, value and nurture human potential in all its forms as we hold ourselves to the highest standard: every child, every chance, every day. It is tremendously challenging work, but that is the professional commitment educators make. Not for the faint of heart; absolutely for the big of heart. Never simple to measure; always important to track. Moving from the individual educator’s beliefs and passions to the systems level, it’s fair to say that 21stcentury learning organizations are becoming more nimble and flexible in designing, monitoring and adjusting the multiple pathways needed to activate, engage and extend kids’ unique intelligences and gifts. It’s a big task. It’s what we do. The discard pile is out of bounds. How do we know how well we are doing? We use those questions to focus individual and system accountability on identifying the ends we commit to and the means we use to get there. Further, declaring priorities and developing a game plan to achieve them invites more openness, transparency and accessibility. It isn’t so lonely when people in our communities – education professionals, parents and our public – understand and have confidence in what we are all about and how we are progressing. Such understanding builds support and momentum. 21st century schools need both. In refreshing our approach to accountability, let’s make the first port of call our most vulnerable learners, those kids who are the outliers in a system that delivers many overall successes and positive trends. In the “old” accountability process, we aggregated individual and cohort group stories into larger data fields, obscuring lack of success with the kids who need us most. Accountability for progress with at risk learnerseliminates any ambiguity about our priority commitment to their life chances. Attention to those youngsters’ learning leads to us to activate research-based practices that are successful in changing learning trajectories. Monitoring and adjusting at the classroom, school and system levels helps us to refine our approaches so the environment fits the kid rather than the other way around. It’s a pretty clear three-step approach, far more progressive and less convoluted than the myriad compliance-type accountability processes that have tied schools and districts in knots for too many years. To those who are inclined to rally in support of making a first priority of “all the other kids” who aren’t in the at risk cohort, we have some good news. Just as a rising tide lifts all boats, it is equally true that application of quality practice, addressing individual needs and attention to learning science benefits all kids. Good learning design works across subjects, learning styles and abilities/challenges. No one suffers. Everyone thrives. Focus…clear priorities…alignment of resources and efforts… adjusting practice in response to evidence: that’s how we activate human potential, one child at a time. It’s where we need to be and it’s happening.